Beams are essentially provided with main reinforcement on the tension side for flexure and transverse reinforcement for shear and torsion. D = Overall depth of the member. The minimum tension reinforcement (As) should not be less than the value of (0.85bd/fy). And the maximum quantity of tension reinforcement should not be greater than the value of 0.04bd. Stirrups should be provided with the compression reinforcement in beams for lateral restraint. 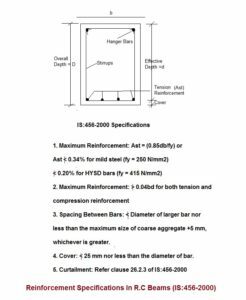 The maximum quantity of compression reinforcement should not cross 0.04bd. 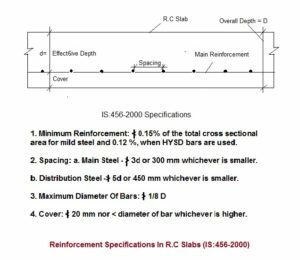 At the point when the depth of web or rib in a beam crosses 750 mm, the side face reinforcement of cross sectional area at the very least 0.01% of the web zone is to be given and disseminated similarly on two appearances and the dividing of the bars not cross 300 mm thickness whichever is smaller. Where Asv = Total cross-sectional area of stirrups legs in shear. Sv = Spacing of stirrups along the length of the member. b = The breadth of the beam or the web in a flanged member. fy = Characteristic strength of stirrups reinforcement, which should not cross 415 N/mm2. For vertical stirrups, the maximum spacing of shear reinforcement should not cross 0.75d. and for inclined stirrups d is considered as 450. The maximum limit of spacing is 300 mm. The details of slab reinforcement are given below.